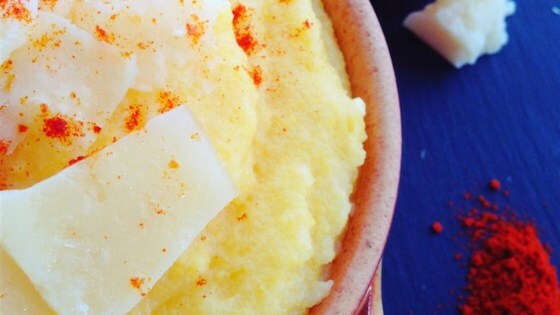 "Easy and delicious creamy polenta. Makes a great side, appetizer, or base for a hearty stew." Stir polenta and chicken broth together in a saucepan over medium heat; cook and stir until the polenta is heated through completely, about 5 minutes. Remove pan from heat. Stir Parmesan cheese, black pepper, and paprika with the polenta mixture. Love this easy dish! Has become a regular side dish with our smoked salmon. Used premade from Trader Joe's. Quick & easy! Simple and very good. A nice alternative to typical sides.